When I was pregnant with my first baby I was lucky enough to be given a beautiful shower by my family. They showered me with gifts including loads of diapers and wipes. 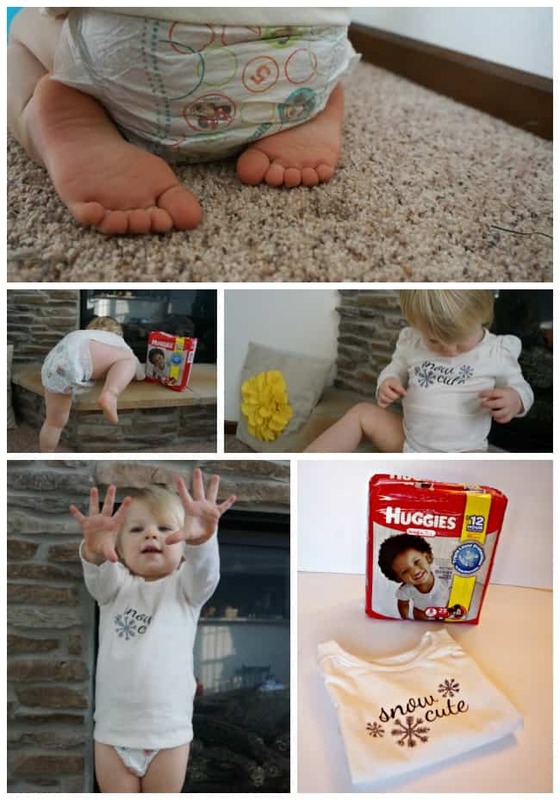 I was able to try out every kind of diaper on the market and always had a stash in baby’s closet. Fast forward 5 years and 2 kids. I often long for the days of endless diapers in the closet, instead of having to make runs to the store when I realize I have only a few diapers left in the house. I’m sharing a gift idea with you today that is perfect for a Mom with little ones like mine. 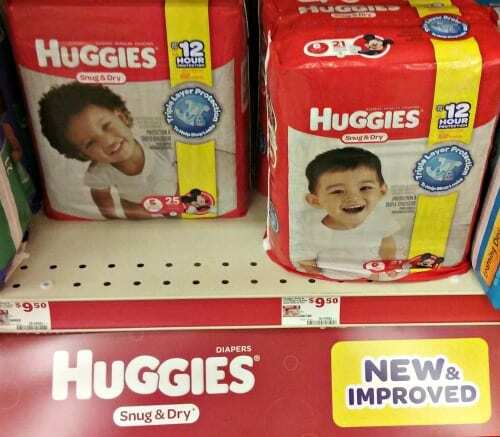 Not necessarily tiny precious babies, but bigger ones still in diapers (like my 1-year-old). Most Moms can still use a little help no matter how old their kids are. 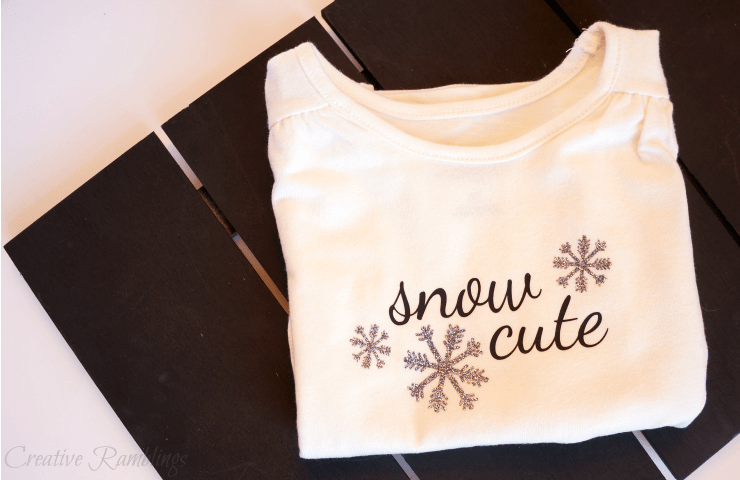 If you are looking for a gift for Mom and baby try this easy to make Snow Cute baby shirt and pair it with a package of Huggies. It will make her day, I promise! I love gifting handmade items, especially to kids. It’s often easier than shopping for hours for the perfect onesie or outfit. I used a stock font on my computer and a few snowflakes from my Silhouette library. Using the Silhouette design studio I arranged them to fit my t-shirt, then cut the snowflakes from silver and the words from black vinyl. I weeded each image and discarded the excess vinyl. Then I arranged the pieces on my shirt and pressed each one with a hot iron for about one minute. 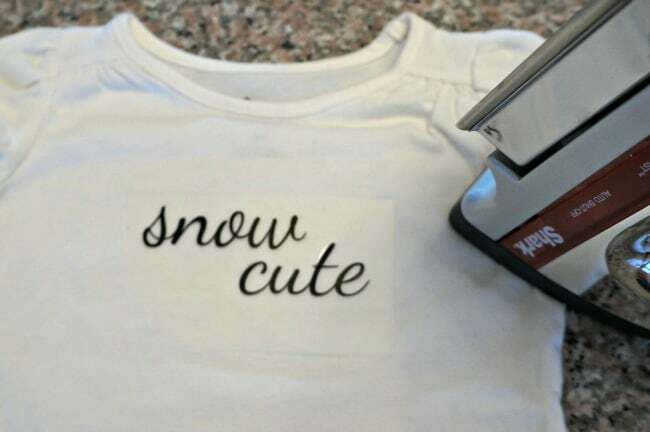 If you enjoy making this simple shirt, check out this adorable onesie, these personalized creations are a bit addicting. A pretty winter white shirt is the perfect gift for a winter baby, or a just because gift for Mom and baby. 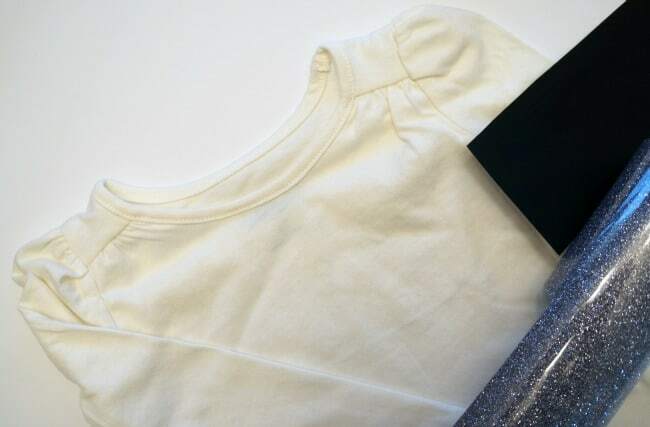 When gifting a clean white shirt to a little baby, I feel obligated to pair it with a package of diapers that will help keep this gift nice and clean. For this gift I stopped at Family Dollar, a great one stop shop for all Mom’s needs at a great value, and grabbed a pack of Huggies diapers. My little one just loves the characters on these and I love how well they fit an active baby. Head to Family Dollar for everything you need to put this cute gift together. Pick up HUGGIES® Diapers, HUGGIES® Wipes, PULL-UPS® Training Pants, or GoodNites® Underwear and all of the great Baby Items you can get at Family Dollar for an everyday low price. What is your favorite gift for Mom and Baby, what would you buy from Family Dollar to make it extra special?